Manny Wasinger received Step 4 Achievement Ring for 200 victories in football. Wasinger was recognized at the CHSCA Hall of Fame Banquet and Introduction ceremony. Congratulations to Monte Vista High School Pan American Day competitors! Congratulations FBLA for your Proformance at districts. 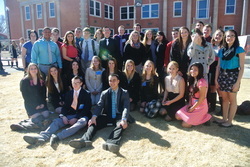 35 students attended and 7 of our students qualified to compete at the state conference in Vail in April. Matt Barnes - Business Communications - 3rd Justin Carr - Desktop Publishing - 4th Chelsea Todd - Personal Finance - 2nd D'Anna Widger - Spreadsheet - 4th Emma DeHerrerea - Job Interview - 5th D'Anna Widger and Steven Valdez - Marketing - 4th Jacob Vance and Donnie Borunda - Entreprenaurship - 4th Sky Edmonds, Emily Logan, and Nohemi Lopez - Hospitality Managment - 1st Courtnie Hunter and Michael Schmidt - Management Decision Making - 2nd. The Monte Vista High School chapter of the National Honor Society inducted five new members at a ceremony on April 27th. For consideration the students must maintain at least a 3.65 GPA (based on a 4.0), perform community service, show leadership and good character. Those pictured are (front to back, l-r): Tyesha Keever, Luis Morales, Noel Heredia, Joseph Roberts, and Graham Oden. 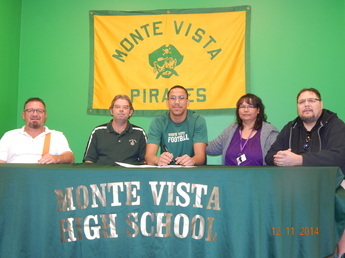 Donald Poole signed National Letter of Intent to play Basketball at Division II Fort Lewis College!! 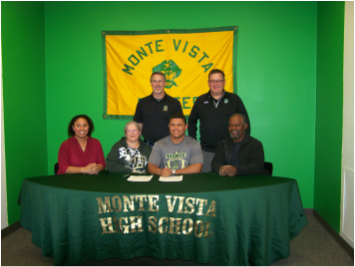 Matt Barnes signed National Letter of Intent to play Football at Division II Adams State University!! 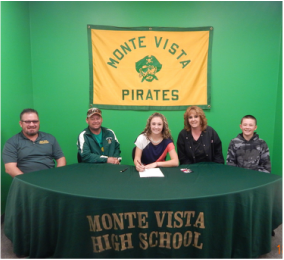 Shelby Hindes signed National Letter of Intent to play Golf at Division II Adams State University! !